A swinging big band with unique instrumentation playing jazz, blues, and Latin. 9. Is You Is, Or Is You Ain't, My Baby? Half price Sale! 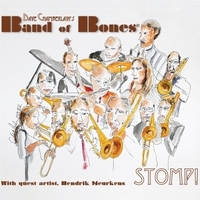 STOMP is now available for $7.50 for the CD and/or download. "a sound that demands attention!" , and All About Jazz has said that we are "undeniably hip!" Check out our website, www.bandofbones.com, for bios of all the band members, photos, videos, and lnfo about our performances. You won't hear a sound like this anywhere else! So check out our great arrangements, exciting soloists and vocalist Kat Gang.